NEWPORT, Oregon, June 6, 2012 (ENS) – An entire dock that has washed ashore just north of Newport, Oregon is debris from the March 2011 tsunami in Japan, the Japanese consulate in Portland has confirmed. On June 4, ocean shore visitors reported seeing a loose dock floating offshore near Agate Beach one mile north of Newport. The dock washed ashore Tuesday and now is sitting at the high tide line. The dock itself is very large and heavy. 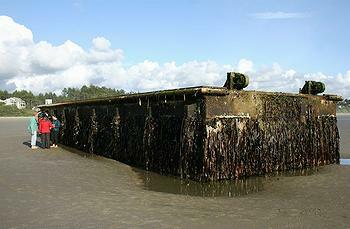 It weighs approximately 165 tons and measures seven feet tall, 19 feet wide and 66 feet long. It is made primarily of concrete and metal, but is clearly designed to float, according to officials with the Oregon Parks and Recreation Department who responded at the scene. Because of its size and the chance it could continue to settle or be moved by wave action, state park staff are posting warning tape and signs instructing the public to stay off the structure. 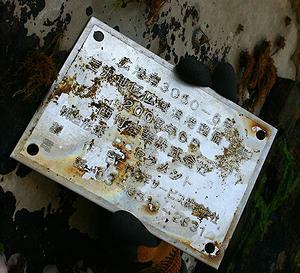 A metal placard bearing Japanese writing, which details the manufacturer and fabrication date, was found attached to the structure and was forwarded to the Japanese consulate in Portland for review. An official with the consulate said Wednesday that the dock came from a fishing port in northern Japan. The placard showed the dock was one of four owned by Aomori Prefecture that broke loose from the Port of Misawa on the northern tip of the main island of Honshu, said Deputy Consul Hirofumi Murabayashi in Portland. Because the dock was believed to have come from a location near Japan’s Fukushima Daiichi nuclear power plant, shortly after it made landfall the structure was checked for radiation. It was found to be negative. Scientists at Oregon State University’s Hatfield Marine Science Center in Newport have verified that there is evidence of marine life specific to Japan attached to the dock. There is some concern about potential invasive species exposure. Among the non-native organisms clinging to the dock are a species of tiny crab that has invaded the U.S. Atlantic coast but not the Pacific coast, and an algae found in southern California but not in Oregon. The Oregon Parks and Recreation Department is working with the Oregon Department of Fish and Wildlife to contain this threat. The state of Oregon is still developing disposal options. Two possibilities are salvage or demolition; both are being evaluated. Scientists with the National Oceanic and Atmospheric Administration had predicted that some of the debris from the Japanese earthquake and tsunami would reach U.S. and Canadian coasts over the next several years. NOAA and University of Hawaii models suggest the majority of the debris will begin to arrive in 2013, and the Canadian government agrees. Oregon Senator Ron Wyden says coastal residents should be prepared for more tsunami debris, which is crossing the Pacific more quickly than anticipated. Some tsunami debris has already washed up on the shores of British Columbia. Earlier this year, an unmanned vessel from Japan was sighted off the islands of Haida Gwaii on the northern BC coast, and a shipping container from Japan with a motocycle inside was found in Naikoon Provincial Park, also on Haida Gwaii. In April, people in Alaska found Japanese soccer ball. Floating material, including buoys and Styrofoam washed up on Montague Island, about 120 miles southeast of Anchorage. On April 5, an unoccupied fishing trawler that U.S. officials said was torn from its moorings by the tsunami was sunk by a U.S. Coast Guard vessel after it entered Alaskan waters and posed a hazard to navigation.